ROOK: Homemade Chicken Stock - so easy, so good. 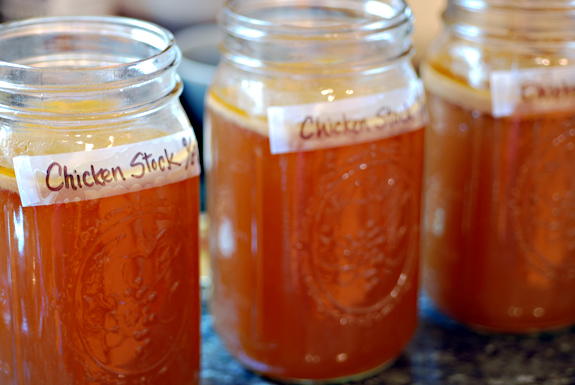 Homemade Chicken Stock - so easy, so good. Homemade stock is so good for many, many reasons. Traditional Foodies seem to believe that it's basically the cornerstone of a good diet. We do it because we believe in getting as much nutrition from an animal if you're going to eat it (if you eat like this it makes being omnivorous the most ecologically sound choice!). Plus we're cheap and we buy good meat and this stretches it further. But mostly we do it because it tastes great. Here's the thing. After we eat chicken (or any bone-in meat) we save all the bones, jellyish stuff and scraps. Yes, even off people's plates! It's going to be both frozen and boiled for many, many hours so any germs will be pretty much obliterated. Stick your chicken bones in a big ziplock baggie in the freezer and add to it over time (keep different sorts of meats seperate). You'll eventually have a bag or two full of bones and bits of gross looking things like cartilage. You can do this either in a slow cooker or on the stovetop. Dump your (still frozen) bones into a large pot or the slow cooker. Add enough water to just about cover the bones. Remember that they will defrost and settle a bit while cooking. You definitely don't want to drown them (imagine using only 1 tea bag in a gallon of water), but you want them to be just about covered. Just. Now you'll add the holy trinity of stock veggies - carrot, celery, and onion. Don't peel anything. A couple of carrots, 2 sticks of celery and one onion cut in half should do the trick for most pots. Be warned - the next photo is really, really gross. But I wanted to show you how much water to use. Now bring it to the boil (or set it on low if you're slow cooker-ing) and then reduce the heat to low. The trick is this - you don't want it to be boiling. You want to see some small bubbles coming to the surface. Now go away and leave it for as long as possible (covered with a lid - there should be no danger of it boiling over if it's simmering correctly). For me, this means overnight or all day. Because it's simmering so slowly and gently I feel fine about going out and leaving the pot cooking on the stove (at this point, you're pretty much using the stovetop as a slow cooker anyway). Now set a colander in a large bowl or another pot and strain your stock (don't be like someone I knew who accidentally poured the stock down the sink!). Let it drip for a while. I usually have to use a couple of bowls because I tend to do a big batch. Let it cool then put it in the fridge. It should set to a firm to hard jelly with a lot of gross fat on the top. Scrape the fat off the top and chuck it out or feed it to a hungry animal. If you're pressed for time you can skip this step, but you'll probably want to try and skim the fat off the top of the liquid stock. You can freeze the stock in baggies - they stack nicely if you freeze them flat. Now you have a really flavourful stock or broth that you can use for many, many things! Remember though, that we didn't add any salt and commercial stocks have a lot so you'll need to add a fair bit. The reason one doesn't add it when you're making it is so you have more control over the saltiness of the the finished dish that you use it in. Once you try this stock in your soups, gravies, and especially risottos, you will not go back.